Sequoia trees (Sequoiadendron giganteum) grow to approximately 300 feet. These giant trees may live to be 3,000 years old. 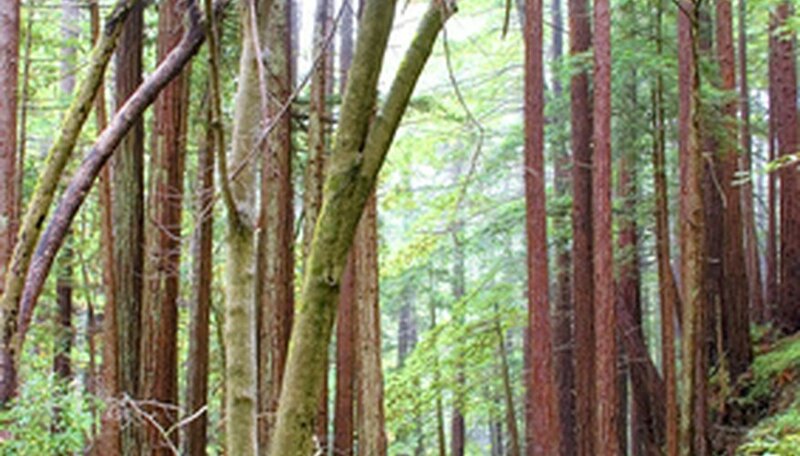 Also known as sierra redwood trees, sequoias make useful trees in windbreaks and screens. These big trees, native to California, thrive in moist, well-drained soils. Although sequoias grow quickly in their native habitat, they require proper care in yards and landscapes to thrive and mature into majestic specimens. You can grow one of these giant trees in your own yard. Choose a sunny site for your sequoia tree. This type of tree prefers full and bright sunlight, but tolerates slightly shady conditions with partial sunlight. Note that intense heat and direct sunlight in warm climates can damage young seedlings. Select a location that provides young trees protection from too much sunlight and strong winds. Avoid planting these trees in low areas that experience frequent flooding or runoff. Prepare the soil in your selected spot to create a healthy environment for your young trees. Loosen the top 2 feet of soil with a garden shovel. Pull out any uprooted weeds or plants and remove any large rocks from your planting site. Incorporate some nitrogen fertilizer into the loosened soil. Follow the instructions on the fertilizer container when mixing and adding fertilizer to the soil. Mix this in with your garden shovel until thoroughly combined with the existing soil. Dig holes for the rootballs of your sequoia seedlings. Make the hole about 2 feet larger than the width of the rootball. Dig your hole deep enough to place the surface of the sequoia’s rootballs even with the surface of the surrounding soil. Place the rootballs in the prepared holes and fill in with your removed soil. Tamp down the area over the roots of the trees to remove any remaining air pockets. Add enough water to each newly planted tree to soak the soil near the roots. Water your young sequoia trees regularly. These trees require generous amounts of water. Keep the soil moist near the roots. Dig a small hole near a tree to check the moisture level below the ground. Water whenever the soil at the depth of the roots shows signs of dryness. These trees often require daily watering during dry spells. Protect your young sequoia trees from damaging winter winds by piling snow high around the trunks.